Do you want the best Birthday Party Ever? 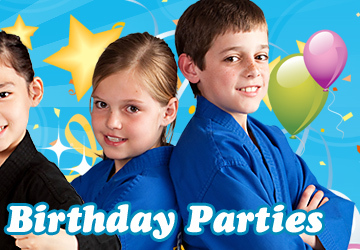 How about a Karate Birthday Party? Would you like to TRULY appreciate your child’s birthday party? Imagine if you had nothing to set up, nothing to cook, nothing to clean, and most importantly NOTHING TO WORRY ABOUT AT ALL. As one parent stated after a recent Birthday party at Sagasu: “Wow we just came from a great birthday party where the staff of Sagasu Family Martial Arts did all the work! And our kids had a great time learning karate and even breaking a board! Cutting the cake with the Samurai was the best for my son. What a great idea. And they learn a little discipline too! Thanks Miss Karen and Miss Maria." I am sure this sounds too good to be true! Well, it’s not. Our Sagasu Birthday parties are fun and fast paced with surprises for a birthday to remember. 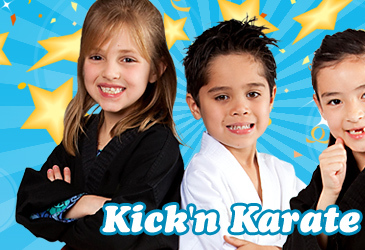 Kids love our birthday parties because they get to learn some COOL Karate moves and have a super fun party. The party starts with a group karate lesson full of special martial arts games and activities (they’ll learn how to safely break a board!) The games are fun obstacle courses with kicking and punching activities and fun reaction drills, such as Dragon Tail and Feeding Time. The kids love it. After the karate lesson, everybody will enjoy pizza and juice and your child will cut the cake with a GENUINE SAMURAI SWORD (with the assistance of one of our Black Belt Instructors)! Our instructors will finish up the party after your child has opened all his/her gifts and thanked their guests. (Don’t worry about cleaning anything up – we’ve got it covered). Our instructors are energetic and enthusiastic and fun! It will be one of the most thrilling and fun Birthday parties your family has ever experienced. Just don’t forget to bring your camera! As with all our great programs here at Sagasu, we encourage parents and adults to attend! Let us make this the best party of your child’s (and your) life! We offer different packages and themes for your personalized birthday party.